Yesterday, in the continuing Texas abortion law saga, the Texas House approved the abortion-restriction bill previously blocked by state senator Wendy Davis. It reportedly requires another vote before passing to the Senate, and facing the formidable Davis once more. 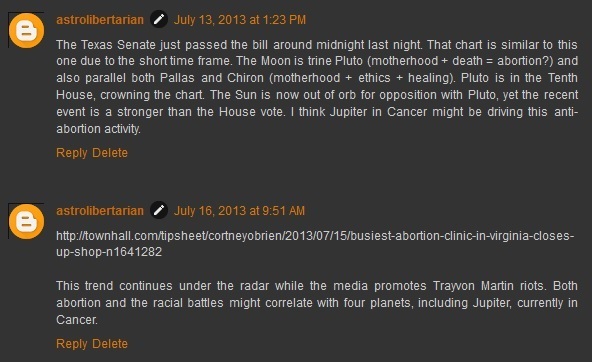 I don't yet have an astrological profile for the sides of the abortion debate, but I have some suspicions as to who the planetary players are. My current candidate for the planetary champion of feminism (and by extension, probably abortion as well) is Pluto (when in connection to Moon and Venus). Anything I write about these topics for the time being is largely speculative. It does not yet carry the weight of hundreds of case studies, as does the political ideology project. The article linked above puts the approval vote after a "full day" of debate but does not specify a time. The chart here is for rough guess of 5pm. The Pallas signature here is largely authoritarian, with Pallas quindecile Pluto. Mercury, ruler of Pallas, is opposite Pluto but also conjunct the Sun, a mitigating factor here. Neptune is quincunx the Moon, a factor we normally associate with the cultural Left -- but Saturn aspects both parties here. Saturn himself is in a wide but tightening conjunction with the North Node, lending him power. Neptune is at the IC, underscoring this picture. The message: the Left, strong but restricted on this particular issue? The Moon in Leo is ruled by the Sun which is trine the North Node. This factor by itself is a cultural Right wing indicator. The political direction of the Moon is under heavy contention. Of course, there is the obvious Sun-Mercury conjunction in Cancer, giving us dialogue about women's issues. On top of this is the Sun-Moon mutual reception, if we didn't get the picture already. The Sun-Mercury conjunction itself is opposite Pluto. This is very provocative and politically-incorrect imagery if we allow that Pluto may represent feminism and abortion (future posts will present evidence for the Pluto-feminist case). This gives us the voice of the family (Sun and Mercury conjunct in Cancer) making a brief stand in Pluto's house against Pluto and what he represents. Uranus in the center, forming a T-square, gives us the elements of public interest and unpredictability. Venus in Leo is tightly square the Nodes: a battle between polarities of feminine expression. The South Node in the Sixth House gives us some potentially bad health consequences, but the chart for the final bill passage (if it happens) will be more instructive. 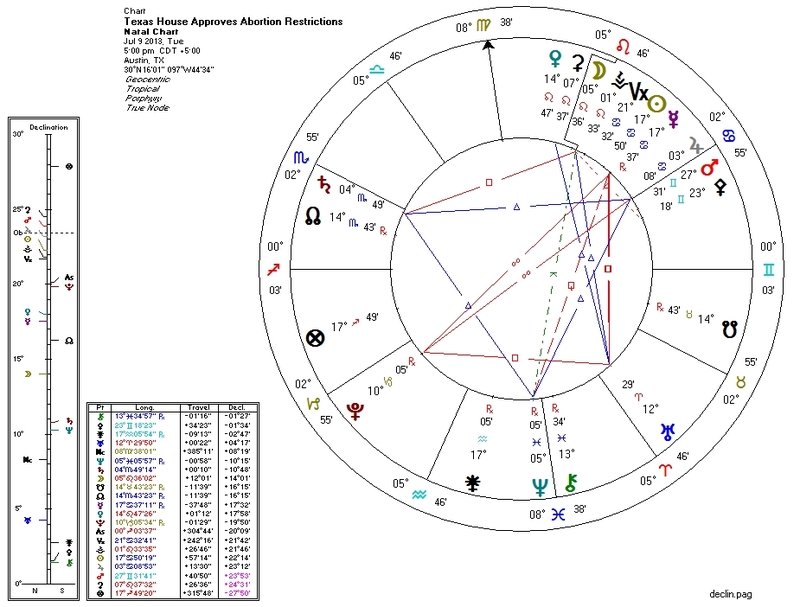 The tightening trine with Pluto suggests that the month might not look so good for Pluto. Another potential factor is Jupiter's waxing opposition with Pluto: Jupiter opposite Pallas strongly interferes with the ideological side of Pallas. Does Jupiter have a similar effect to any ideological side of Pluto? If so, we may see anti-abortion forces in other states see victories in the near future. If this debate makes it to July 14, we might see an upset in favor of the pro-choice forces. Mars enters Cancer and the Moon moves into position for a loose grand cardinal cross with Moon, Mars-Jupiter-Mercury, Uranus, and Pluto.